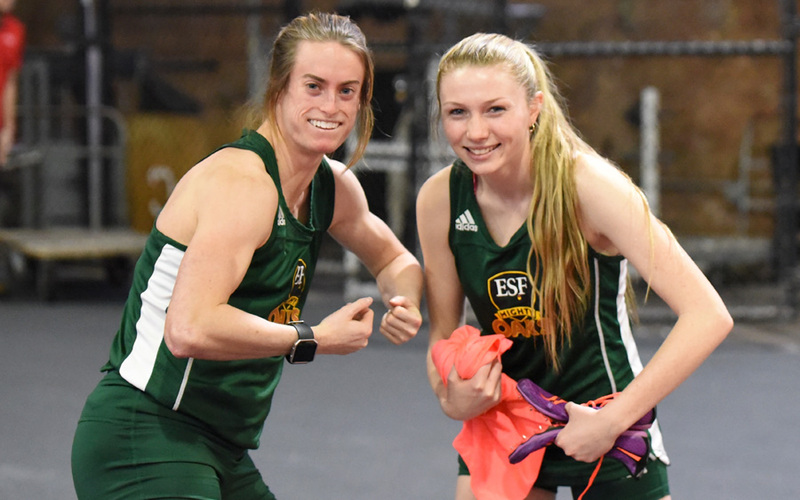 Shannon Gordinier and Marissa Lathrop are the recipients of the prestigious 2018 SUNY Chancellor's Scholar-Athlete Award. Gordinier, a senior wildlife science major, set several school and course records in 60-, 100- and 200-meter dash during her Mighty Oaks track career. Gordinier was also a star on the soccer field, she was second on the team in scoring with 13 goals during the 2017 season. In the same season she was named to the USCAA All-American First Team as well as an Academic All-American (student-athletes with an overall GPA of 3.5 or higher). Gordinier will start a job this summer at Letchworth State Park outside Geneseo, New York. Lathrop, a junior, had a stellar 2018 track season setting several school records and top 10 finishes in the 800-meter, 1,500-meter and 5,000-meter races. Lathrop also had a tremendous cross country season. The environmental biology major finished in fifth place overall at the 2017 USCAA Cross Country National Championships and placed in the top five in several races during the cross country season. Student-athletes are nominated for the chancellor's honor by their campus athletic director. Their credentials and accomplishments are reviewed by a panel of athletic directors from across SUNY as well as the provost's office.